Few months ago I was craving to make some lentil soup, which I have made many times without a recipe!, so I went to Damascus on Atlantic Ave and bought a bag of green lentils. What I do isn’t anything fancy. Onions, carrots, maybe a celery, potatoes, veggie stock…etc. I usually like to through in whatever I have in the fridge that I think will go well in a lentil soup. Egg flower lentil soup anyone? As usual with many things I got sort of bored of drinking lentil soup so I decided to not make soup with it. Instead, eat it with pasta. Add oil to a hot pot and throw in the diced onions and cook for couple minutes. Then throw in the garlic and chili flakes. When you start to smell the garlic, add the carrots. Cook for a few (3?) minutes. After that add the lentils and season. Give everything a good mix and stir. Then add in enough liquid to cover the lentils (about 1/2 inch over) and it could be all stock or all water or a mix of both. Bring it to boil, cover the pot with a lid, then lower the heat and let simmer for an hour or until lentils are soft (give the lentils a stir once in a while). When lentils are done, you can do few things, either use a stick blender and turn it into a nice chunky soup and maybe add a dash of cream or add it to pasta. When the lentils have another 15-20minutes of cooking left, get a pot of water going for the pasta. When water starts to boil, cook the pasta according to the directions on the box/package. Optional, add the baby bok choys into the pasta when you have about 2 minutes of cooking left. 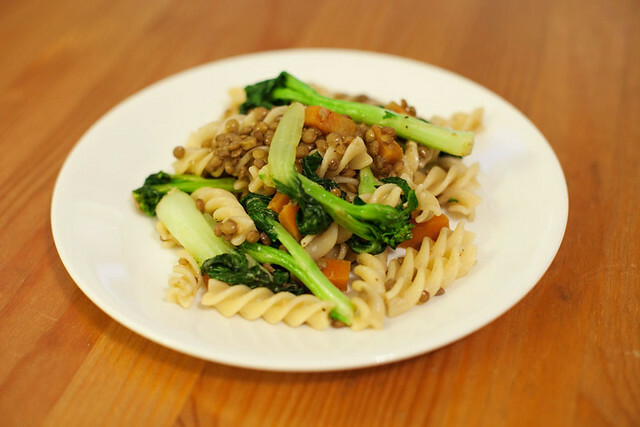 Drain the pasta and bok choy and add the lentils but not the liquid from the lentils. May need to season again. If the pasta looks dry, add couple tablespoons of the lentil soup. Grate some cheese over it and serve. Maybe a squirt of lemon juice here might be nice also. Of course you can cut the amount of lentils that go into the pasta and save them for the soup. Then you’ll have a nice meal of lentils with pasta and lentil soup. Eat the meal with some bread?